The first photographic antique we collected was a daguerreotype. We had read about them in photo history books but when we held one for the first time we were awestruck by its beauty. A reproduction in print or on the screen can only hint at its magic. A well made daguerreotype has incredible detail and depth. The fragile nature of the image, a thin film of mercury highlights on a polished silver surface, requires protection in a miniature case or a frame and the reflective surface makes the act of viewing interactive and intimate. Try to imagine how the process must have appeared to the 1839 world that had never seen a photograph! On this page we will share a few from our collection and add additional pages soon. It is not possible to name one favorite among more than 150 images we have collected but if pressed to pick one it could be the image on the right. A young boy and girl (brother and sister) sit by a window. The inclusion of the window frame suggests it might have been made in their home rather than a studio. The quality of the light, the calm demeanor of the children, and the wonderful detail all add to the charm. The checks of the girls dress and the little boys freckles are incredibly sharp and clear. It is cased in an odd size (almost square) case and mat that is the height of a 1/4 plate. The overwhelming majority of daguerreotypes made were portraits. 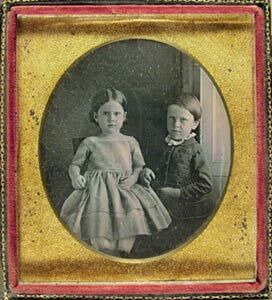 It was the ability to capture and preserve likenesses of loved ones for an affordable cost that made the daguerreotype such an immediate success. From the beginning there were daguerreotypes of houses, cityscapes, and landscapes. We do not know the ratio of portrait to non-portrait but do know that over the years of searching we have seen thousands of portraits for every one non-portrait. We have three antique and three modern outdoor examples in our collection of over 150 daguerreotypes. 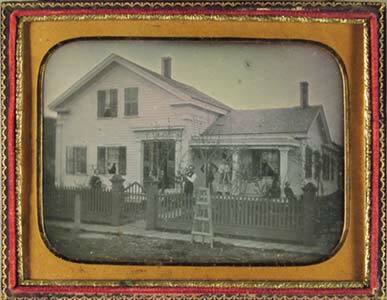 On the left is a 1/2 plate daguerreotype of a white house behind a picket fence. There are eleven people in the yard, on the porch, or in a window. The man in shirt sleeves at the center of the picture holds a baby and the three figures on the right appear to be children. Is it a new house or was there a traveling daguerreotyist in the neighborhood? Is it an extended family or neighbors who dropped in for the day? We will never know since there is no information or identification with it. 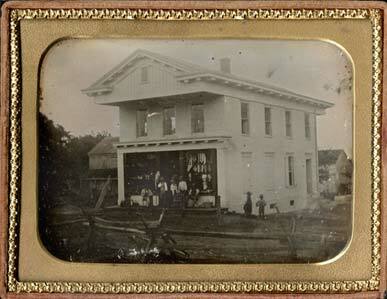 This is a cased image of a white frame building that has a general store on the first floor. The second floor is likely a lodge hall since you can see through the windows that it is an open space. A split rail fence can be seen in the foreground. There are no signs on the store so we can not identify the place. We were told that it was likely New England by the seller. An enlarged view of the porch shows several men and boys lounging. Displayed in the windows are stockings, a clock, teapots, and vases. 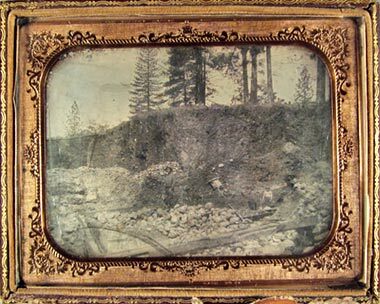 The 1/2 plate landscape on the left demonstrates the fragile nature of the daguerreotype as well as an extraordinary luck for survival. It was bought for 25¢ in a roadside flea market as a bare, unprotected plate that had tarnished to solid black. Since the image on a daguerreotype surface is so fragile that it can be removed with a feather and the unprotected silver plate will tarnish to black if not protected from air this should have been a lost cause! The original purchaser was a friend who called us to ask how to clean it. We no longer clean daguerreotypes, but (like most collectors of the time) we did so in the 60s and 70s. We gave him instructions and within an hour got an excited call. "It's a mining scene!" Yea right. But it was! When he dispersed his collection we acquired it. It is in amazing condition considering the state in which it was found with only a few scrapes on the surface. It shows a cut away hillside with six men and the sluice of a hydraulic mine. We assume it is a California gold mine. 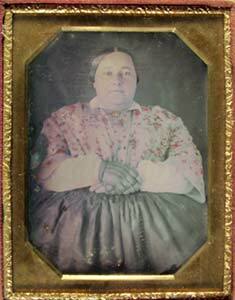 The surface of the daguerreotype was not easy to paint or color but the desire for color was always strong. Powdered pigment was carefully stippled onto the surface. Most often it is the skin that is tinted but clothing and jewelry were sometimes colored as well. In the 1/4 plate below all the girls have tinted skin and rosy cheeks but only the second girl from the right has color added to her dress and necklace. Jack calls her "the birthday girl" and thinks she got special treatment for that reason. 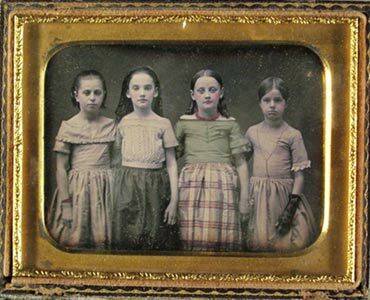 Beverly can visualize three other daguerreotypes with each girl given carefully tinted. Children were sometimes pictured with their toys. 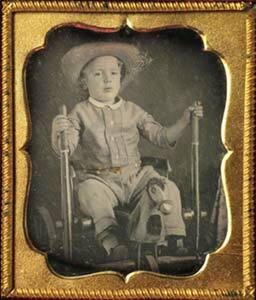 The boy shown below sits on a riding toy in the form of a cart with a horse's head in the front. This type of toy is still made today and called the Irish Mail. It moves forward by pumping the two handles. The large lady in the 1/6 below really fills the frame! Her flower print blouse is tinted in shades of pink and she wears fingerless net gloves. The pin at her neck has been scratched so that the underlying silver plate adds sparkle to the jewelry.